Many Amazon Web Services (AWS) customers require a data storage and analytics solution that offers more agility and flexibility than traditional data management systems. A data lake is a new and increasingly popular way to store and analyze data because it allows companies to manage multiple data types from a wide variety of sources, and store this data, structured and unstructured, in a centralized repository. The AWS Cloud provides many of the building blocks required to help customers implement a secure, flexible, and cost-effective data lake. These include AWS managed services that help ingest, store, find, process, and analyze both structured and unstructured data. To support our customers as they build data lakes, AWS offers the data lake solution, which is an automated reference implementation that deploys a highly available, cost-effective data lake architecture on the AWS Cloud along with a user-friendly console for searching and requesting datasets. AWS offers a data lake solution that automatically configures the core AWS services necessary to easily tag, search, share, transform, analyze, and govern specific subsets of data across a company or with other external users. The solution deploys a console that users can access to search and browse available datasets for their business needs. The solution also includes a federated template that allows you to launch a version of the solution that is ready to integrate with Microsoft Active Directory. 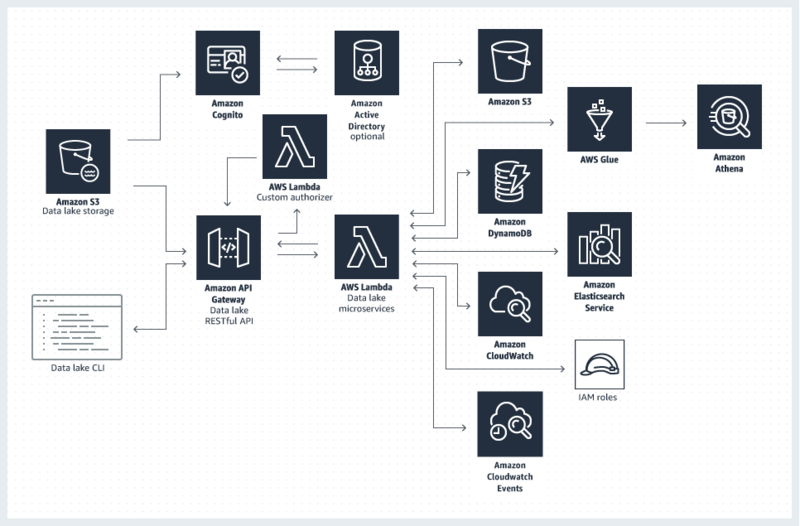 The diagram below presents the data lake architecture you can deploy in minutes using the solution's implementation guide and accompanying AWS CloudFormation template. The AWS CloudFormation template configures the solution's core AWS services, which includes a suite of AWS Lambda microservices (functions), Amazon Elasticsearch for robust search capabilities, Amazon Cognito for user authentication, AWS Glue for data transformation, and Amazon Athena for analysis. The solution leverages the security, durability, and scalability of Amazon S3 to manage a persistent catalog of organizational datasets, and Amazon DynamoDB to manage corresponding metadata. Once a dataset is cataloged, its attributes and descriptive tags are available to search on. Users can search and browse available datasets in the solution console, and create a list of data they require access to. The solution keeps track of the datasets a user selects and generates a manifest file with secure access links to the desired content when the user checks out. Leverage this data lake solution outof-the-box, or as a reference implementation that you can customize to meet unique data management, search, and processing needs. Leverage pre-signed Amazon S3 URLs, or use an appropriate AWS Identity and Access Management (IAM) role for controlled yet direct access to datasets in Amazon S3. Optionally, you can enable users to sign in through a SAML identity provider (IdP) such as Microsoft Active Directory Federation Services (AD FS). Secure and manage the storage and retrieval of data in a managed Amazon S3 bucket, and use a solution-speciﬁc AWS Key Management Service (KMS) key to encrypt data at rest. Use the provided CLI or API to easily automate data lake activities or integrate this solution into existing data automation for dataset ingress, egress, and analysis. The solution automatically creates an intuitive, web-based console UI hosted on Amazon S3 and delivered by Amazon CloudFront. Access the console to easily manage data lake users, data lake policies, add or remove data packages, search data packages, and create manifests of datasets for additional analysis.